I read this article and found it very interesting, thought it might be something for you. 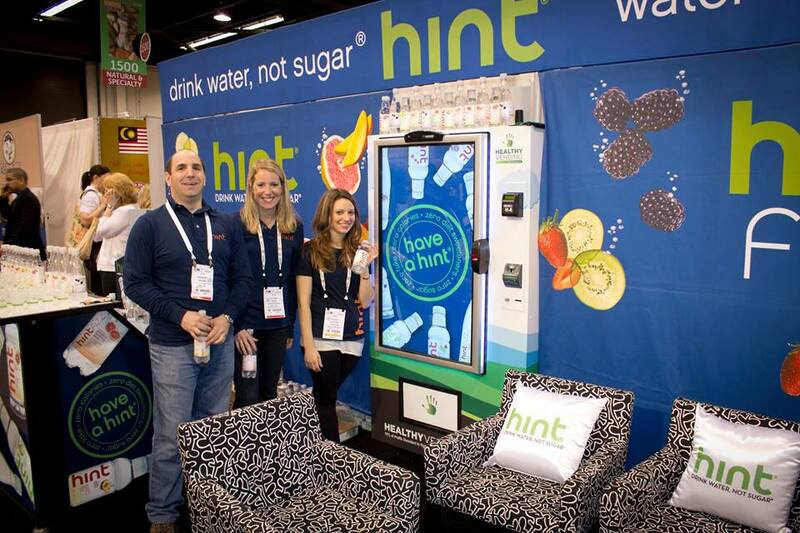 The article is called Expo West 2014: Interviews and Trends from the Trenches and is located at http://www.healthyvending.com/blog/expo-west-2014-interviews-trends-trenches/. This past week, the HUMAN team attended the Natural Products Expo West in Anaheim, CA—the motherland of the $99B natural products industry. The Expo drew together over 60,000 attendees and over 2,500 exhibitors across natural and specialty foods, organics, supplements, health and beauty, natural living and pet products. 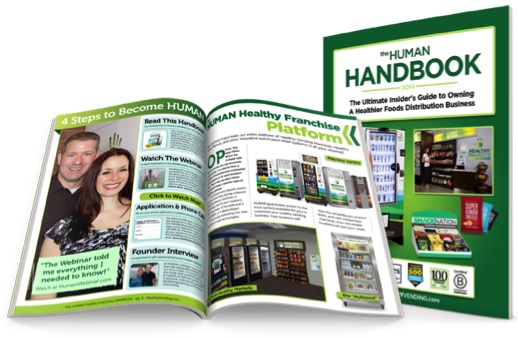 Several members of the HUMAN team were in attendance to speak with the leadership behind our favorite brands, get a pulse on the latest trends, and create strategic partnerships (so that we can pass that value on to our franchisees!). While I joined my colleagues on the Expo floor, I also covered the Expo as a blogger as part of the Expo’s We.Blog editorial board alongside 11 of the West Coast’s top bloggers, including: Daily Baez of Daily Curlz, Erica Dermer of Celiac and the Beast, Amy Hendel of HealthGal, Lynn Hirshfield of Participant Media, Sarah Kay Hoffman of a Gutsy Girl & A Loving Spoon, Whitney Lauritsen of Eco-Vegan Girl, Aubrey Nielsen of Oh So Delicioso, Rachel Sarnoff of Mommy Greenest, Jules Shepard of Jules Gluten Free, Lindsay Tredent of FitAndAwesome, and Brandon Waloff of The Health Crunch. We interviewed industry leaders and brand ambassadors and sampled hundreds of food and beverage products (tough job, but someone has to do it ;)). In addition to the interviews, we wanted to bring you news of the most interesting new product launches within the HUMAN-approved products world. So, after conferring with the HUMAN team and my notes, we’ve pulled together a list of the brand updates that we think you’ll be most interested in, listed below in alphabetical order. Annie’s showcased their latest gluten-free granola bars, which are available in Double Chocolate Chip and Oatmeal Cookie. 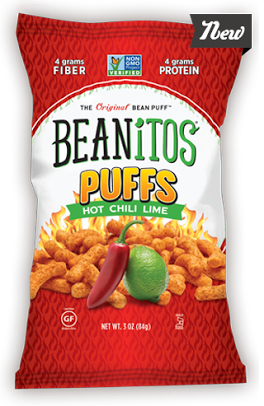 Beanitos launched its new line of “Puffed” snacks in two flavors: Hot Chili Lime and White Cheddar. A 1 oz. serving packs an impressive 4 grams of fiber and up to 5 grams of protein. Plus, Beanitos are non-GMO, low-glycemic, gluten-free, and contain no MSG or preservatives! CLIF Bar launched the newest addition to its CLIF Kid Zbar line, Zbar Protein. A protein snack made with organic whole grains, Zbar Protein is made with pea and whey protein, plus a blend of wholesome rice crisps and toasted organic oats atop a thin layer of chocolate. Zbar Protein comes in three kid-favorite flavors including Chocolate Chip, Chocolate Mint and Peanut Butter Chocolate. Health Warrior launched three new flavors of its industry-first chia bars: Mango, Dark Chocolate Cherry and Next Generation Peanut Butter Chocolate. Did you know that ounce-for-ounce chia seeds have more omega-3s than salmon, more fiber than oatmeal, and are loaded with protein, calcium, and antioxidants? KIND Healthy Snacks introduced STRONG & KIND, the brand’s new savory snack line and a movement aimed at changing the way people view strength and kindness.The new line features five flavors: Honey Smoked BBQ, Honey Mustard, Roasted Jalapeño, Hickory Smoked and Thai Sweet Chili. Each bar contains 10 grams of natural protein (soy-and-whey free), whole almonds, seeds and legumes, and comes packed with nine essential amino acids. The line is gluten free, non-GMO, low sodium, and contains no MSG. 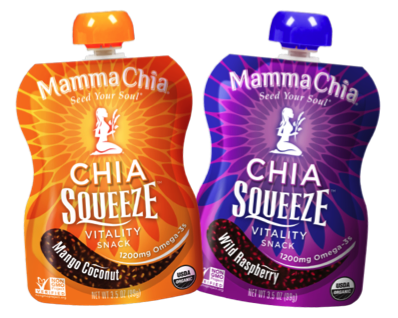 Mamma Chia unveiled a new Chia Squeeze four-pack size, perfect for people on the go. The new four-pack will be available in four flavors, including the new Mango Coconut, Blackberry Bliss, Strawberry Banana and Green Magic. Each pack contains 4g of fiber and 1,200 mg of Omega-3s. All Mamma Chia Squeezes are non-GMO verified, gluten-free, vegan, kosher and Certified Organic by the USDA. We loved interviewing founder, Janie Hoffman, who is very involved in giving back to her community. Mamma Chia is a Certified B Corporation, a member of 1% For the Planet and a founding member of the Slow Money Alliance. Mary’s Gone Crackers launched its new graham cracker line, Mary’s Gone Crackers Graham Crackers, which features two flavors—Classic and Chocolate. As with all of their products, Mary’s Gone Graham Crackers are gluten-free and made with certified organic, whole-food ingredients. The new line will be available for purchase by consumers online in May and in stores in June. Nibmor debuted its new Daily Dose of Chocolate square flavor: “Daily Dose of Dark Extreme.” Nibmor uses only the most delicious organic, non-GMO, Fair Trade and gluten-free ingredients, and we appreciate that. Promax launched a new flavor to its line of original bars: Greek Yogurt Honey Nut, which boasts 20g of protein per bar. In addition to being suitable for those with gluten allergies, Promax Original bars are vegetarian and free of artificial sweeteners, preservatives, high fructose corn syrup, trans fats, maltitol and gelatin. The original line includes 6 other delicious flavors, including Cookies ‘n Cream, Double Fudge Brownie, Nutty Butter Crisp, Chocolate Peanut Crunch, Chocolate Chip Cookie Dough, and the new flavor will be available in-stores in March 2014, with a suggested retail price of $1.79 per bar. Pure Bar debuted two new flavors of its certified organic, non-GMO line of bars: Peanut Butter Chocolate Ancient Grains and Cashew Coconut. The Ancient Grains bar contains complete vegan protein, provides fiber and antioxidants, has 8g of sugar with 5g of protein per bar and is low in sodium. The Cashew Coconut bar uses an innovative protein source, Sacha Inchi, which is a seed that provides complete vegan protein and omega 3 healthy fats. It’s also delicious. Sambazon launched new 10.5-ounce grab-and-go sizes of its popular functional beverages, Protein Recharge and Purifying Greens, each crafted with emerging Amazon Superfoods to deliver positive nutrition and exotic taste. Seapoint Farms debuted its Dry Roasted Premium Black Edamame with Sea Salt—the second in their growing Premium Black Edamame line. Like all of Seapoint Farms edamame, the Dry Roasted Premium Black Edamame with Sea Salt is a gluten-free, heart-healthy, non-GMO and protein-rich snack. Yum! Vega One Meal Bar (new recipe) is packed with protein, fiber, Omega-3s, plus vitamins, minerals, antioxidants, probiotics and greens. Vega Sport Bar (new recipe) has 15 grams complete, multisource, plant-based protein, plus 2.5 grams BCAAs and 2 grams glutamine. Vega Sport Energy Bar (new name, new recipe) packs whole food energy to help you go the distance. In terms of trends that we noticed for the industry, in many ways, this year proved very similar to last year, with a couple new surprises. Coconut and chia are still the hottest ingredients. Perhaps the only thing that’s changed here is that there’s more of a focus on everything related to coconut (so, not just coconut water, but chips and yogurt made from coconut, too, and coconut oil is being used in everything). The words “super food” are still big—with “new” superfoods still being mysteriously found and touted. Gluten-free is being shouted from the rooftops, even for items that are no-duh gluten-free. Check out Celiac Beast for her gluten-free-focused recaps of Expo West here. Paleo is huge. We even saw a “snack bar” that was paleo….made with lamb. Chew on that. In terms of beverages, there were two prominent trends: 1) drawing attention to the fact that no sugar was added (stevia being the non-calorie sweetener of choice; even in several new energy drinks) and 2) HPP beverages are hot. HPP beverages are made via “high pressure processing,” which supposedly is a pasteurization process that doesn’t kill nutrients as much as high-heat processes do. The trend we’re most excited to see is the Certified B Corporation trend! As you probably know, HUMAN is a Certified B Corporation, which means we literally integrate social and environmental stewardship into our Articles of Incorporation. We saw at least four newly certified B Corporations, including Sweet Riot, Hilary’s Eat Well and Love and Hummus. Way to go, natural products industry and B Corporation! If you attended Expo West, what products were you most excited to find? What trends did you notice? Anything from the Expo you wish we would have covered? Let us know in the comments. If you’d like a HUMAN healthy vending machine, snack delivery service or micro-market at your school, gym, hospital or office location, please contact us HERE. We’d love to get to know you and answer all of your questions.